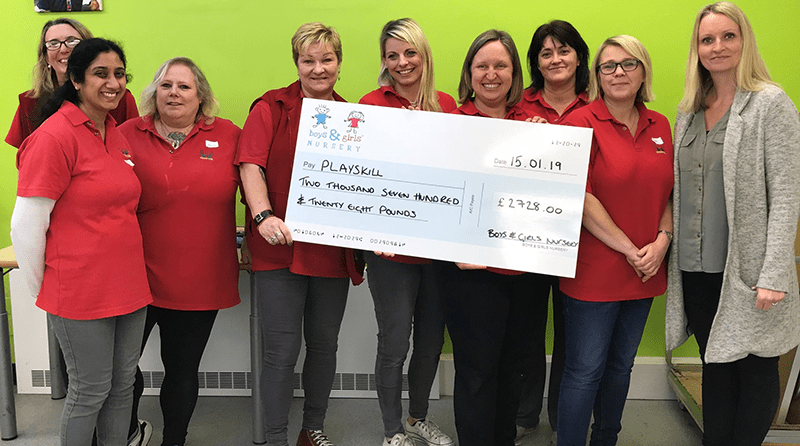 Boys & Girls Nursery were thrilled to fundraise for Playskill – their chosen charity for 2018. Playskill is a local charity that runs parent and child term-time groups for pre-school children with special physical needs in Watford and Hemel Hempstead. Playskill are run by a skilled team, including a Paediatric Physiotherapist, Occupational Therapist and Speech and Language Therapist and they rely on grants and donations in order to keep their much-needed services running. Throughout 2018 the Boys & Girls Nursery team hosted many fundraising events within each of their nurseries in Croxley Green, Rickmansworth, Stanmore and Watford. From delicious bake sales, cosy PJ days and a charity day, to raffling off fabulous festive hampers which were created with the help of local companies and nursery parents. Between the team, the children and the parents over £2728 was raised, an amazing amount that will help support the services that Playskill offer. Natasha Kirby, Director, Boys & Girls Nursery, proudly said “Our team have worked really hard to put on a variety of fundraising events throughout the year. We had a great year supporting Playskill and I would like to thank everyone who donated money or items to help us reach a fantastic sum of £2728”.